A walking pole, or two, can be a fantastic hill walking aid to relieve pressure on legs, knees, feet. Especially with heavily laden packs, on long days, or multi-days. They can get in the way on certain terrain, or if using a map and compass. I generally have one strapped to my backpack and have found it invaluable on many occasions; however not in its typical use. Here is what I love walking poles for! Bad blister or sore knee - having a pole to use can be the difference between getting off the mountain before nightfall; or being caught in darkness. For a sprain or proper leg/foot injury a walking pole becomes an invaluable crutch - once it is still alright for yourself, or the casualty, to be standing or walking. For loose, tricky, steep, rocky ground - self explanatory. Prevention is far better than cure. Keeping your feet dry and keeping your legs dry for as long as possible is important in our mountains, in our weather. I have seen someone become hypothermic over several hours from a simple case of slipping waist deep into bog and not warming up afterward. A walking pole makes a great ground tester! Even where a stream is safe to cross - the stream bed, or stepping stones, are often very slippery and I have seen many a person take a simple slip right into a stream. That is them fully wet then for the rest of the day potentially. A walking pole or two can make stream crossing far more stable. When making a bivy bag stretcher/survival bag stretcher - you can roll a walking pole up into the outer length of the bivy bag, on each side of your improvised stretcher. These become stretcher handles. A walking pole generally separates into two or three shorter sections of pole. Ankle, knee, leg, elbow, arm - all can be splinted using walking pole sections. Pad the pole with a scarf, shirt or bandage to ensure it's not sharp or cold against skin; then tie firmly into place. I used this method last year with a student who dislocated their knee - splinted walking pole sections down either side of the knee, tied into place with triangular bandages. 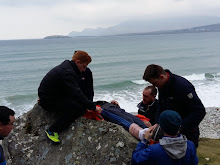 Some of these points relate to first aid and for this I highly recommend Marie Lyons from www.remotewestfirstaid.com if you are interested in first aid training. Thank you to Portwest for their poles!